Yup, it’s pretty chilly at the mo, but if anything can lure me outside it is a scenic stroll and a roaring pub fire. 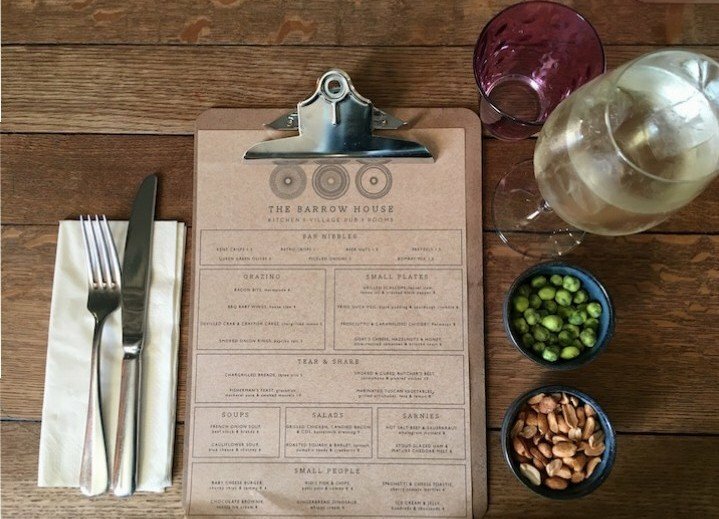 And it was on one of those gloriously clear, yet crisp, days that I discovered this perfect walk/lunch combo at The Barrow House, a gorgeous new pub in Egerton from the team behind ever popular The Milk House in Sissinghurst. Egerton sits not far from the M20, almost exactly half way between Ashford and Maidstone – or if you’re coming from west Kent, just up past Headcorn. 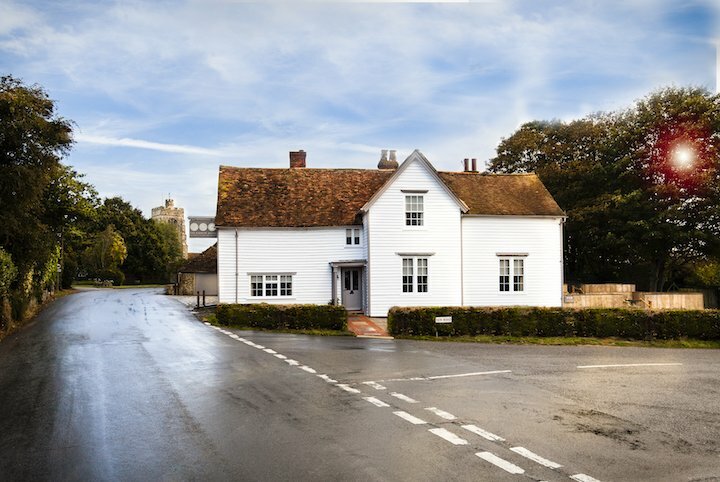 This period pub (previously The George Inn) had been sitting empty when it was recently taken over by husband and wife team Dane and Sarah Allchorne. 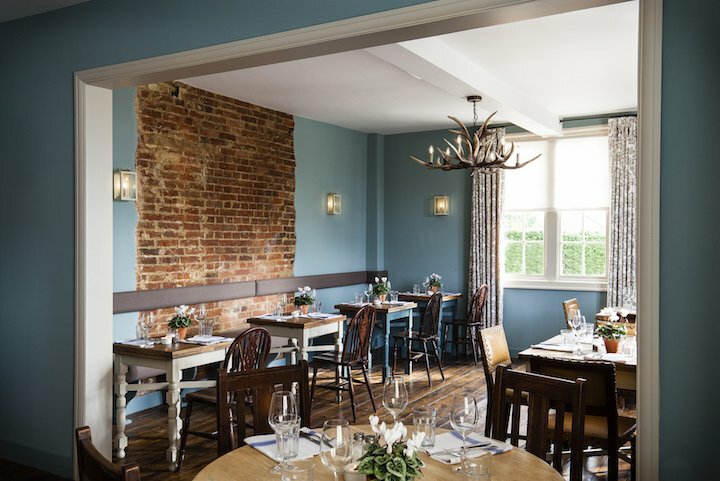 The dated interior was ripped out and replaced with a sympathetic refurb where cosy painted walls and log fires sit side-by-side a few welcome funkier touches. The new name is a nod to the Bronze Age barrows, or burial mounds, found nearby, see pic above, where the Anglo-Saxon social elite lie beneath (history fans, you know what I’m taking about!). We started our trip with a circular walk – to take in the pretty local landscape and for the mini muddies to see the burial mounds (you mean I can walk on actual dead people?!). We followed Walk 2 from this fab selection I found here (they vary in length – note the pub is still referred to as The George on the map). The Dining Room – love those lights! 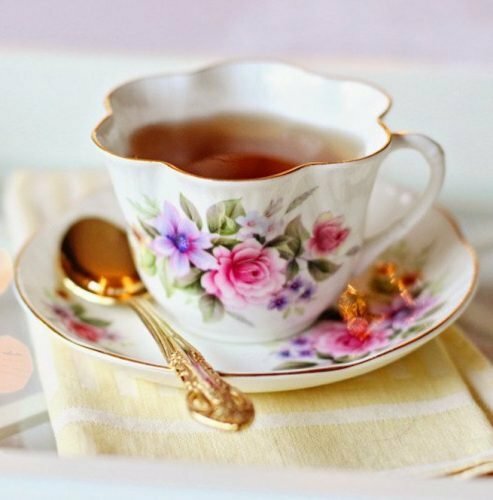 What’s it to be: Barrow House Brew or Dandylion Teas? 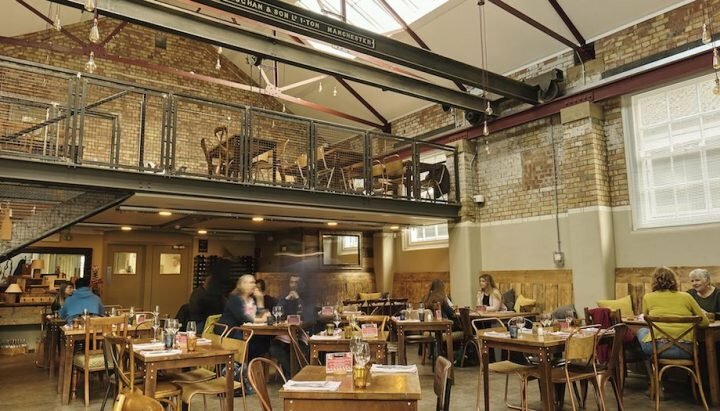 Inside, there’s a more informal, yet very cosy Bar Area, where dogs are allowed or a more formal Dining Area, (pictured above) which is kept dog-free. 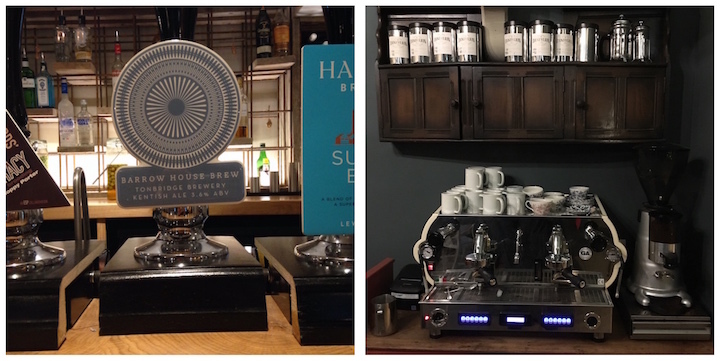 There’s a fabulous long bar offering a great selection of local ales and craft beers, including their own Barrow House Brew, (pictured above), or if you prefer a cuppa then there’s a local tea artisan, Dandylion Teas, (also pictured above) to wet your whistle. Right, on to the food! 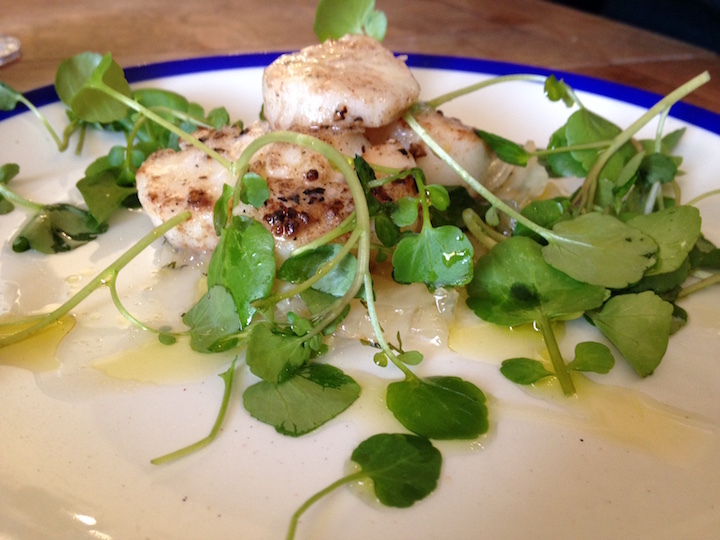 We started off with a Tear & Share option, below, Smoked & Cured Butcher’s Best as well as Grilled Scallops, also below. Then for Mains: 28-Day Aged Beef Burger for Mr Muddy and my friend Phil chose the Smoked Slow-Cooked Brisket, (pictured below), which he reported as being marvellously melt-in-the-mouth. 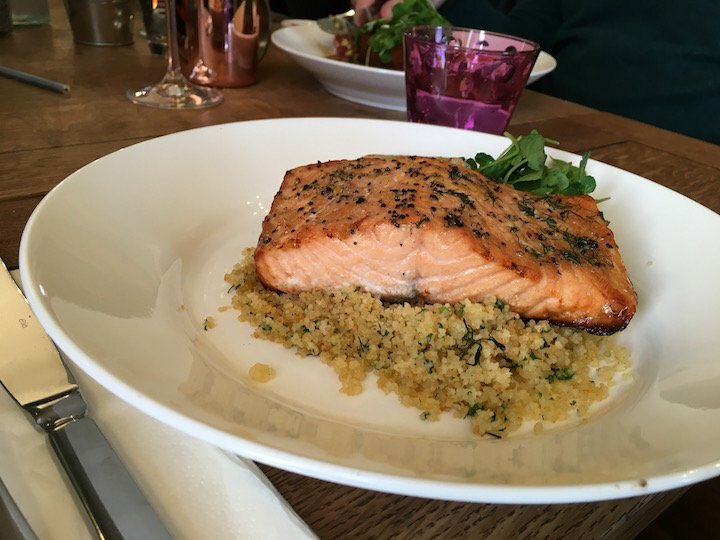 And it was Brown Sugar Salmon Steak with Tabouleh & Lemon for me, (also pictured below). Excuse me while I scrape my chair back and recline in satisfied splendour. Yes, I’ll take a Peppermint Tea to wash it all down (probably best). Now, the great thing about this pub is it’s ideal for the Mini Muddies too. 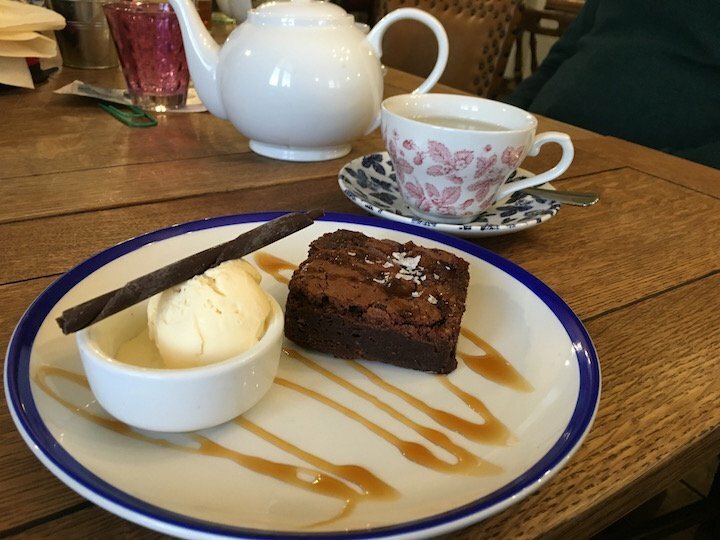 Mine enjoyed Baby Cheese Burger & Chunky Chips and Kids’ Fish & Chips – both perfectly sized portions (my kids are 8 and 9 years old) followed by Ice Cream & Jelly for one and Chocolate Brownie and Ice Cream the other. Everyone’s a winner! Outside is a kid-friendly, contained garden and play area, with steps leading to seating on the over-looking terrace – perfect for when the weather warms up. 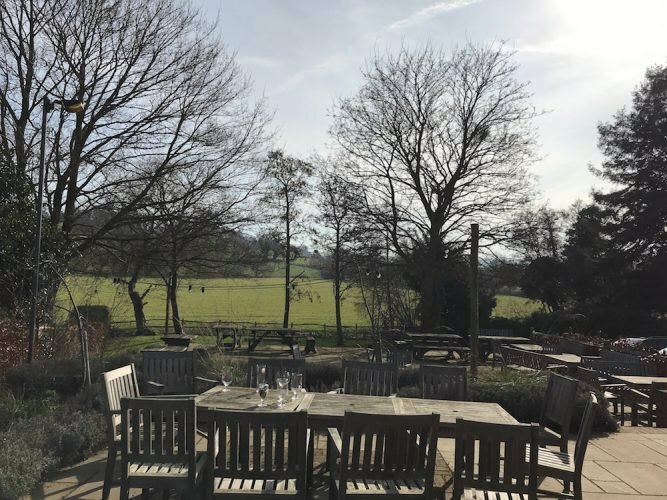 It makes an ideal Sunday lunch destination – you know on those days when some fresh air and the promise of a slap-up lunch might just numb the hangover for a few hours at least. Or why not even make a weekend of it and stay over? 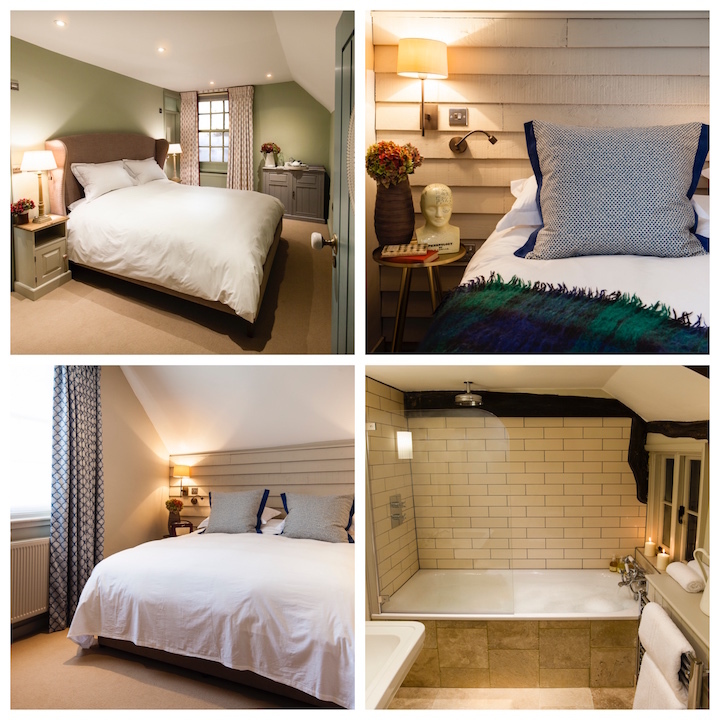 I’ve not yet mentioned the brand-spankingly new and super stylish bedrooms upstairs (all with en suite bathrooms – and a hearty breakfast is included in the morning). 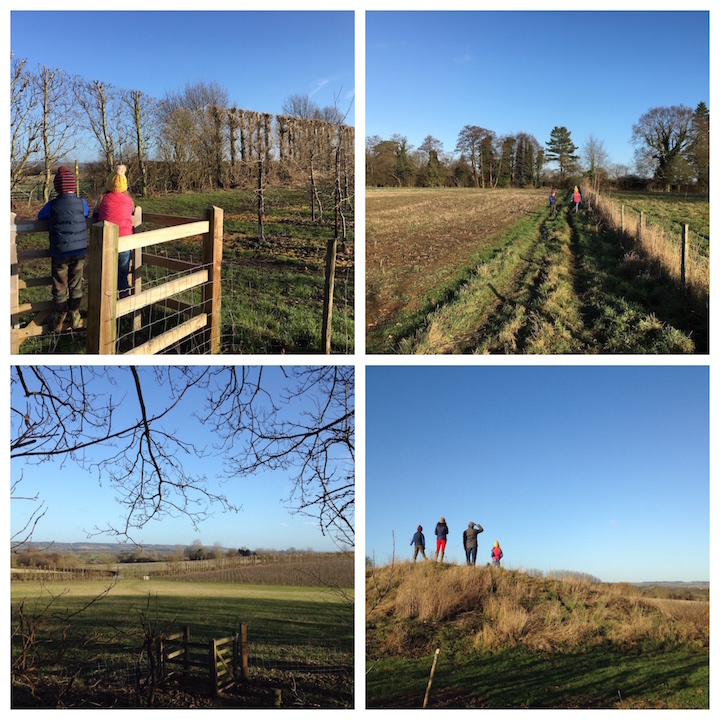 There’s lots nearby – from Leeds Castle and Godinton House & Gardens to the Stour Valley Walk. 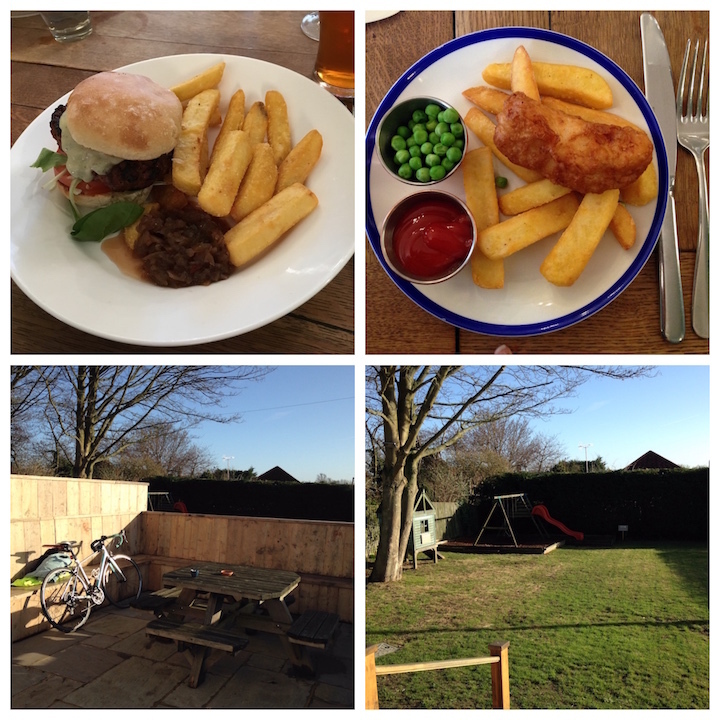 There are also some great cycling trails apparently and certainly the pub seemed popular with cyclists. 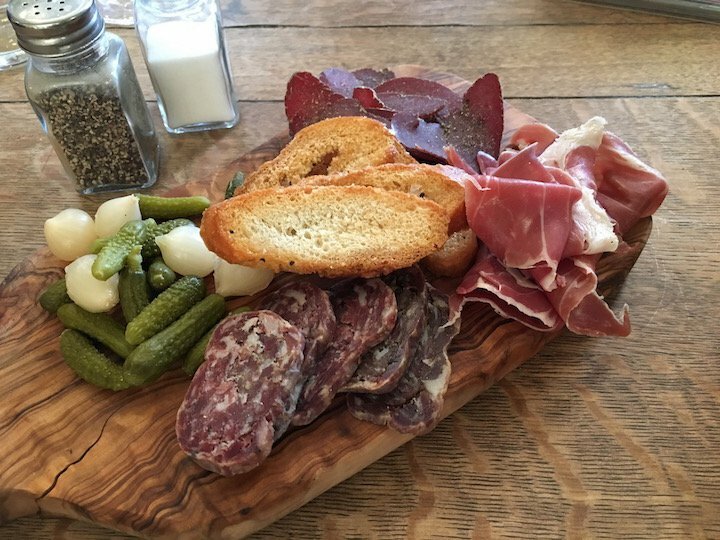 Good for: Relaxed foodies, Sunday lunchers, family walkers will all love it here. When the weather warms up smaller kiddies can play happily in the garden while you enjoy a drink on the terrace (there is a road nearby so overlooking little ones is probably wise!). Not for: The food is definitely on the gastro scale so if you’re after a chip buttie, it may not be your bag. Dog walkers remember you will be restricted to the Bar Area and dogs aren’t allowed in the Rooms. 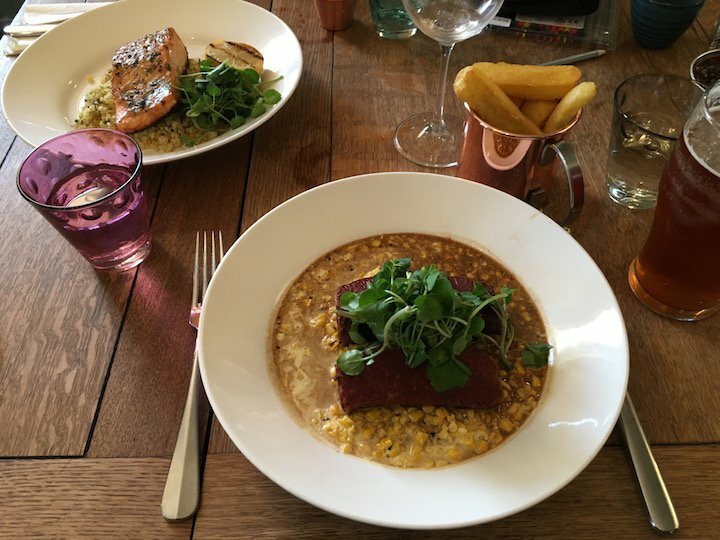 ££: Mid-range I’d say with Small Plates (or starters) between £6-£8; Mains from around £10-£16 for Brown Sugar Salmon Steak with Tabouleh & Lemon (28-Day Aged Beef Burger, £12, or Smoked Slow-Cooked Brisket, £13) and Desserts all £6. Childrens’ Mains, £6, and Desserts, £4. Soups (£6); Salads (£8) and Sarnies (£8) are available in the Bar Area.